Here is a brief check list of issues to consider when purchasing microscopes. The type of microscope: The decision between compound and stereo (dissecting) microscope is a central issue. I would make this decision based on the age or grade level of the students. I do not recommend the use of compound microscopes for very young students, for a variety of reasons. If primarily elementary school to lower middle school students are to use the equipment, it may be well worth considering to purchase stereo microscopes only. Compound microscopes demand more extensive sample preparation (unless purchased slides are used) and more experience in handling and are thus more suitable for older students. There are also paedagogical issues related to the choice of the type of microscope. 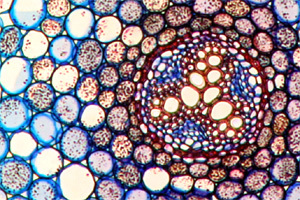 Stereo microscopes supply a three-dimensional upright image at a lower magnification. Parts of the specimens that can also be seen using the naked eye can now be observed much larger. It is much easier for the students to imagine size relationships this way. Schools with sufficient budget purchase both types of microscopes. The number of microscopes: How many devices should be purchased? This is not only a budget issue. The costs of microscopes can vary greatly and it is easily possible to obtain 20 cheap devices for the same amount of money as 5 expensive instruments. What is the class size? How many students should use one microscope? How much storage space is available? What are the curricular demands? This question can not be easily answered an a few lines. I would recommend one microscope per 2 students. For a large class of approximately 30 students, this would mean 15 instruments. If the school intends to purchase both stereo and dissecting microscopes, storage space for 30 instruments must be available. Curriculum: What skills should the students learn? Are sample preparation, staining, making specimen cuts a part of the curriculum? If yes, then there is probably no way around a compound microscope. Should rocks, insects and every-day objects be observed? In this case it may be more suitable to obtain stereo microscopes. The manufacturer of the body and optics: There are many manufacturers that supply schools with comparatively cheap devices. Often the optics are not manufactured by these companies but purchased from specialized firms and included in the set. In my view the brand of the device is of minor importance. Available servicing is a much more important factor to consider. While microscopes generally do not require much maintenance, it may be necessary to readjust some of the parts periodically. Over the years the oil becomes thick and the focussing knobs become difficult to turn. A firm that is willing to perform the routine maintenance makes life for the teacher easier (unless the teacher him/herself is capable of maintaining the equipement).